It’s a new crossover that’s big on attitude and self expression. It demands attention with dynamic styling and nimble performance, while Nissan Intelligent Mobility means seamless connectivity, and available advanced driver assistance features. 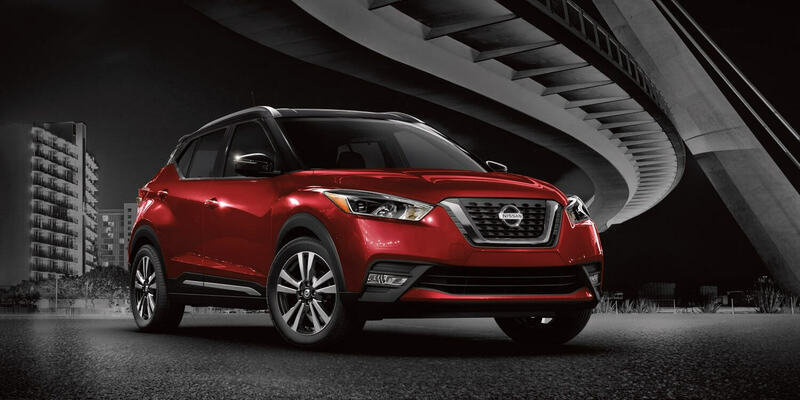 The brand new Nissan Kicks. This is tech that moves you. From a distinctive interior you can personalize to an expressive exterior design that lets you stand out from the pack, Kicks is all about your style. With advanced technology engineered around you, from class-exclusive Bose® UltraNearfield™ speakers built right into the headrest to a customizable information display to Apple CarPlay™ and Android Auto™, every drive will be memorable. Best-in-class fuel economy, an Xtronic CVT, and available advanced driving technologies are just what you need to rule the city. Feature availability is dependent on vehicle model, trim level, packaging and options. Compatible connected device may be required and feature availability may be dependent on device’s capability. Refer to connected device’s owner’s manual for details. Late availability for some features. Driving is serious business and requires your full attention. Only use features and connected devices when safe and legal to do so. Some features, including automatic crash notification and SOS, are dependent upon the telematics device being in operative condition, its ability to connect to a wireless network, compatible wireless network availability, navigation map data and GPS satellite signal receptions, the absence of which can limit or prevent the ability to reach Customer Care or receive support. GPS mapping may not be detailed in all areas or reflect current road status. Never program GPS while driving. Only use Remote Engine Start and Remote Horn features in accordance with any laws, rules or ordinances in effect in your vehicle’s location.Some services and features are provided by independent companies not within Nissan’s control. Should service provider terminate or restrict service or features, service or features may be suspended or terminated without notice or with no liability to Nissan or its partners or agents. Services and features may require compatible cellular network provided by independent companies not within Nissan or its partners’ or agents’ control.Cellular network signal strength may vary and may not be available in all areas or at all times. Services and features may not function if cellular network is unavailable, restricted, or terminated. Nissan and its partners or agents are not responsible for associated costs or other third party changes that may be required for continued operation due to cellular network unavailability, restriction, or termination (including equipment replacements/upgrades, if available, or roaming charges on alternative networks). Technology is evolving, and changes by independent companies are not within Nissan’s or its partners’ or agents’ control. Enrollment, owner consent, personal identification number (PIN), and subscription agreement may be required to receive full suite of features and services. Trial periods (if applicable) begin on the date of vehicle purchase or lease of a new Nissan. Trial periods may be subject to change at any time and may be subject to early termination without notice. Required subscriptions may be sold separately for each available feature or service after trial period ends, and may continue until you call service provider to cancel. Installation costs, one-time activation fee, other fees and taxes may apply. Fees and programming subject to change. Feature may be subject to age restrictions in some areas. Subscriptions governed by service provider’s subscription agreement, terms and conditions and privacy statements available at service provider’s website. Text rates or data usage may apply. The Nissan names, logos and slogans are trademarks owned by or licensed to Nissan Motor Co. Ltd. or its North American subsidiaries. Other trademarks and trade names are those of their respective owners.Terms and conditions of Subscriber Agreement apply. NissanConnect EV features are provided by Nissan North America. Sirius XM Connected Vehicle Services Inc. (“Sirius XM”) partners with Nissan North America to provide NissanConnect Services powered by SiriusXM. All stated terms, disclosures and limitations of liability associated with connected vehicle services extend to Sirius XM and its affiliate, Sirius XM Radio Inc. SiriusXM is a registered trademark of Sirius XM Radio Inc.For important safety information, system limitations, and additional operating and feature information, see dealer, owner’s manual, or www.NissanUSA.com/connect/important-information. AutoPacific segmentation. Comparison based on 2018 Nissan Kicks™ vs. latest in-market competitors (excluding hybrids). Base models compared. 2018 EPA Fuel Economy Estimates 31 city / 36 highway / 33 combined for 2018 Nissan Kicks S. Actual mileage may vary with driving conditions – use for comparison only.